Poitiers preserves an incredible richness of ancient architecture—some of the finest in Europe. Poitiers's long and eventful history has left it with a surprising number of fine examples of French and European architecture. Built in the 800s to serve as the castle of the Counts of Poitou and the Dukes of Aquitaine, the palace was destroyed by fire in 1018, rebuilt, burnt again in 1346, and rebuilt again between 1388 and 1416. The oldest Christian building in Europe dates from about the year 360, when it was built on the site and foundations of an earlier Roman building (276). Of course, it has gone through many changes: damage by the Visigoths in the 400s, repairs in the 900s, frescoes added during the 1100s to 1300s, re-purposing as a warehouse in the late 1700s, under threat of demolition in 1834, saved and restored during the 20th century. Besides the ancient baptistry, which has been restored to a good semblance of its early Latin appearance, there's a small museum of ancient finds. 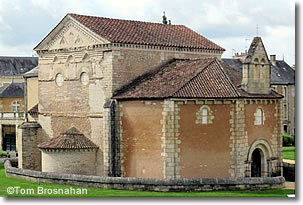 Notre-Dame is Poitiers's fine High Romanesque church, having been rebuilt and expanded in the 1000s. Heavily decorated inside and out, it's regarded as a masterpiece of the style, and may be the oldest High Romanesque church in Europe. Poitiers's Romanesque and Early Gothic cathderal, the largest medieval monument in the city, dates from the 1100s, when its construction was ordered by King Henry II of England and Queen Eleanor of Aquitaine, rulers of Poitier sat the time. The rulers are immortalized in the 12th-century stained glass windows. The city's major art museum, built in the 1970s, preserves works from pre-historic times through the medieval period to works from recent centuries, such as sculptures by Auguste Rodin and Camille Claudel, and paintings by Piet Mondrian and Odilon Redon. Baptistère Saint-Jean, the oldest Christian building in Europe.